It’s been approximately five years since I purchased my first fishing kayak, an Ocean Prowler Big Game. My number one priority had been to find a kayak that was, for me at least, the perfect fishing platform. I’ve never understood why people become so wrapped up in the speed of a kayak when looking for something that is to be primarily used as a fishing platform. The only exception is perhaps for the dedicated lure fisherman who wishes to cover a large amount of ground during a session. For me my primary interests were storage, rigging potential and stability. The latter was of particular importance as I envisaged that much of my fishing would take place at night and alone. As it happened that’s pretty much the direction that my kayak fishing has taken. I spent approximately six months carrying out extensive research before deciding that the Big Game fulfilled my requirements almost to a tee. Since purchasing my kayak I’ve tried out several other kayaks and the resultant experience has never left me in any doubt as to my original choice of kayak. To be honest, despite often having the yearning for a new kayak, there was nothing out there that could come close to replacing the Big Game as my ultimate fishing kayak. Some time ago I took an interest in Hobie kayaks, I found the idea of the Mirage Drive quite fascinating. The Adventure model initially appealed to me, though I really wanted maximum stability so I soon found myself looking at the Outback. An opportunity arose to purchase an almost new Outback with every conceivable extra at a good price, though as I’d never tried one I’d have been buying blind so I allowed the opportunity to pass me by. It was during a kayak fishing trip to Florida in August this year that I finally managed to try out an Outback in anger. That turned out to be quite an experience and my belief that the Big Game couldn’t be beaten as a fishing platform was shattered. The Mirage Drive is simply superb and highly effective. Having the ability to propel yourself along virtually hands free is quite something. 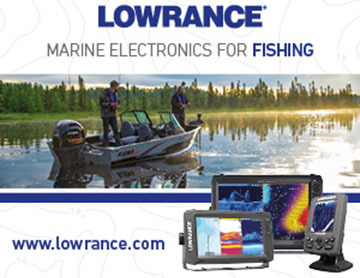 For the lure fisherman in particular this really has to be experienced to fully appreciate it. In Florida I’d struggled to fish close to structure, the wind and tide pushing me into the structure, minimising my fishing time before I was forced to pick up a paddle to move away into a better fishing position. I looked on at the Hobie anglers with growing envy, they were happily fishing away, peddling occasionally to maintain or change their drift. Their fishing time remained uninterrupted, I was probably losing 30-50% of my fishing time paddling to stay clear of the structure. The stability of the Outback is simply superb, you can stand with ease and move around unhindered when accessing the rear tank well, front hatch, etc. It had plenty of rigging space and potential, plus the Mirage Drive (this example had a Turbo Fin upgrade) provided an impressive turn of speed for such a wide kayak. I was highly impressed with the kayak and it far surpassed my expectations. In my mind at least my Big Game had become redundant, to make that reality I needed get my hands on a Hobie Outback. To say I found myself in a very fortunate position the following month is a bit of an understatement. The HobieCat Centre in Poole offered to sponsor me and provide me with a Hobie Outback to fish from. In the space of a month I’d gone from owning what I considered to be the ultimate fishing kayak, to having those thoughts shattered only to end up having a Hobie Outback parked up in the garage… lucky guy! 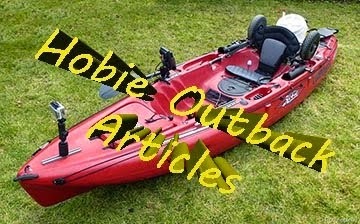 Here are the basic specifications of the Hobie Outback, I believe the one I have is the 2010 model. The first thing that caught my attention was the overall quality of the moulding, far better than any similar kayak that I’ve experienced to date. It’s a wide kayak, though its weight is about on par for a kayak of this size. The Mirage Drive is actually quite light and can be removed and fitted in seconds. It’s highly unlikely to be fitted whilst loading or unloading the kayak so this weight is purely present when the kayak is rigged. The weight capacity is excellent, fully dressed in a dry suit I weigh in at around 200lb so there’s clearly a lot of spare capacity!. Looking at the topside, the kayak is clearly aimed at the angler. It sports four moulded rod holders as well as recessed areas and drink holders around the cockpit area. The rudder controls are hand operated and adjacent to the seat. There are two large circular hatches, one situated directly forward of the seat whilst the other is in the rear tank well area just forward of the rudder. The forward hatch sports a removable tackle tray with lid, though this can be upgraded to a deeper ‘bucket’ type insert. Both hatches offer a positive twist and turn to lock mechanism which appears to be highly effective and is easy to use. The front hatch is of a generous size an easily permits good sized dry bags, etc to be stored with ease. A removable insert can be purchased as an optional extra and this would potentially be ideal for storing fish or as additional storage compartment. The front hatch is quickly and easily secured using a bungee. I recently carried out some capsize drills and all the hatches proved to be watertight with no problems of water ingress being experienced. This takes me onto the seat and what a great seat it is!. At a glance is looks rather thin, perhaps a little flimsy, though I was soon proved to be very wrong. The seat is secured to the kayak using two inserts that expand when tightened. The securing clips are covered by a Velcro flap with the seat in position. There are two sets of insert holes on the kayak providing further adjustment if required to suit the individual. The seat is positioned as required and tightened into position, the two front straps at secured to kayak strong points and the seat back is kept upright by securing a lightweight bungee cord. It really is simplicity itself. There’s no requirement to remove the seat for transportation or storage and the seatback can be folded forward and secured in the down position using an existing bungee cord. The seat back is self-inflating and the firmness can be quickly adjusted to suit the user. The seat base itself is a honeycomb affair is provides a decent cushion. As for the ride, well the seat sits up from the foot wells and the ride is comfortable and extremely dry. There’s also a small net just forward of the front hatch that’s ideal for storing pliers, disgorgers or other smaller items of tackle, the sort of stuff that that you need to be readily to hand. As mentioned earlier there are moulded recesses either side of the cockpit area. These are ideal for keeping tools and tackle to hand as required. 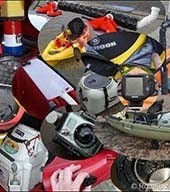 Though I’d recommend that anything of value is kept leashed to the kayak at all times!. I intend to use the rear recesses for mounted some RAM rod tubes, though this will be covered at a later date. The rudder comes as a standard item, this is purely down to the kayak being designed with the Mirage Drive being the primary mode of propulsion. With a more conventional paddle a kayak can be steered using the paddle, however the Mirage Drive is purely a propulsion system so a rudder is required to provide directional control. The rudder setup itself is quite ingenious and a pleasure to use. There are two pull-operated toggles, one for lowering and one for raising the rudder. When lowered, the ‘down’ toggle is secured in the lowered position with a cleat to prevent inadvertent lifting of the rudder when underway. The steering control is left of the seat and is a simple rotating control. Turn it left and the kayak will steer left, turn right and the kayak turns right, what more could you ask for!. The rudder itself is highly responsive and the kayak can be make extremely tight turns when peddling under power. With the rudder in the stowed position the blade can be tucked and secured under the rear tankwell bungee cord for transportation. On either side of the kayak there is a paddle holder. It’s been well thought out with two mouldings on either side of the hull which permit the paddle to sit in position whilst a bungee cord is present to maintain hold it securely until required. It’s worth looking at the hull as this is responsible for providing the Outback with its outstanding stability. It’s very similar in design to a ‘semi cathedral’ hull as you’d encounter on certain fishing boats. There are scupper holes present in the seat area and rear tankwell, though you certainly cannot miss the large hole in the foot well area!. This is of course the mounting hole for the Mirage Drive, it also doubles up as a scupper hole. That takes me onto the Mirage Drive itself. As simple as it is the pedal driven flippers work extremely well. Without effort the boat can be pedalled at 3 to 4 mph. This pace can be maintained for long periods of time, even a light headwind had very little effect on the achievable speed. The pedals themselves can be quickly adjusted to suit an individuals leg length. The kayak featured here sports the standard fins, though these can be upgraded to larger fins as required. I’ve now pedalled the Outback with both standard and Turbo fins fitted. I personally prefer the latter though they wouldn’t be for everyone. I’ll cover the fins and their differences in a later article. As you pedal the drive is converted into flipper movement, approximately 180⁰ side to side. Ideally the full or majority of the pedal range is used to provide the most effective propulsion. However this requires approximately 18” of water, however it can still be used with good effect in shallower water by limiting the pedal travel (fluttering the pedals) and minimising the flapping of the flippers. I pedalled effectively in 6-8” of water using this method. Speed is reduced dramatically though forward progress is maintained. With a pedal pushed fully forward the flippers are positioned hard up against the kayak and the pedal drive has minimal effect of the draft of the kayak. If required the kayak can be paddled in shallow water and if deemed necessary the Mirage Drive can be removed in seconds and stored within the kayak. Sure, nothing is perfect!. Care has to be taken when venturing into shallow water to prevent damage to the fins, particularly the supporting masts. A two piece paddle comes as standard and is more than adequate for occasional use. Ok, it’s not a high end carbon fibre paddle, though it is ultimately only there as either a backup propulsion system or to be used as required. I’ll finish off by taking a look at the Hobie kayak trolley. It’s specifically designed for use with the Hobie and is attached by passing the posts through the rearmost scupper holes. There’s a small toggle and pin mounted and secured to the top of one of the trolley posts that can be used to lock the trolley in position if required. To fit the trolley the kayak is rolled onto its side and the trolley inserted. To remove it the kayak is lifted, the trolley falls clear and the kayak can then be swung to one side and lowered to the ground. The trolley can either be partially dismantled (wheels removed with a quick release pin) or stored fully assembled in the rear tankwell, the trolley being stored upside down in the same scupper holes as used previously. I didn’t notice the presence of a securing bungee, though this can easily be added and would be strongly recommended. I was a little concerned about the high sides of the Outback, would this design make re-entry excessively difficult?. I took the Outback afloat and threw myself out of the kayak. The kayak failed to flip so I flipped it over myself. Righting the kayak was a little more difficult to what I’m accustomed to, though not overly difficult. Re-entering the kayak proved to be easy enough, in fact I was surprised as the amount of secondary stability that was present considering the high primary stability and hull shape. It’s not a kayak that’s easy to capsize!, however, it’s always sensible to practice re-entry on a new kayak prior to taking it any distance from land. As much as I’ve already taken the Outback afloat, this is purely an initial review. 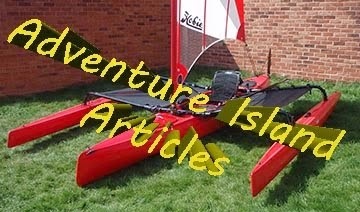 I’ll provide a more detailed review in the coming weeks along with detailed articles and video clips on rigging, modifying and fishing from the Hobie Outback. For further information feel free to either drop me an email or contact the UK Hobie Centre direct where they’ll happily arrange a demonstration for you. Excellent review, Rob, indepth and very informative. I had looked at Hobie kayaks during the year after I had purchased my present kayak and I will seriously consider purchasing one when I become economically viable again. Perfect outdoor enthusiast's dream machine - a kayak and a bicycle merged. LOL. Pól Ó Muireasáin. Hi Rob - speed can be a lifesaver, if you end up the wrong side a fast tide rip with an oncoming wind. Where I fish I've had those conditions a couple of times, and both times I've had paddle my Scupper Pro (no slow kayak) to near exhaustion to get back to where I could safely beach up and have a rest. It's either that, or get swept out to sea in some really rough conditions, so you have to watch yourself. I've a friend who has a Hobie (Adventure? ), he loves it, but he's generally a long way behind me in the 40-50 min paddle coming home. But if Hobie one day design a kayak for more speed, I'll definitely take a look at what they offer. I'm actually on the look out for even more speed than my Scupper Pro, as the Scupper Pro's a rotten platform to fish from. Probably a Dorado II next I think. I generally fish the Bristol Channel and regularly experience tides of 4 knots in the deeper water. I always plan my trips around the tides, in the event of an emergency I can cut across the tide into calmer water, before making my way back againt the tide if required. Could I paddle a couple of miles back against a 4 knot tide?, probably, but I'd hate it!, it'd take rather a long time that's for sure. The Outback can be happily pushed along at 4mph, 5mph with more effort. I've peddled the Outback with the Turbo fins and it's considerably faster, very impressive for a kayak of that width. But going back to your original statement reference speed, in five years I've never found myself in a postion where a faster kayak would have been of major benefit. Sure, I've endured the odd slog against some tide, but in well over two hundred trip those instances are well into single figures. The Hobie Adventure is a fast kayak on paper, however, a kayak is only as good as the paddler/peddler. Fitness, technique and paddle choice all come into the equation. A couple of years ago I paddled with a guy in a Prowler 4.7, he was impressed with its speed compared to his previous kayak. He couldn't keep up with me in my Big Game!,and I've had many similar experiences. Each to their own, it's perhaps dependent on your type of fishing, though I still strongly believe that speed is seriously over-rated in the UK when it comes to selecting a fishing kayak. NOOOOOOO!!!! just as I was coming to the decision that the Big Game would suit me as a first fishing kayak you review the Outback giving me yet more food for thought. Still no harm done as I have set myself the target of losing two stone and improve my fitness before I take the plunge and get into kayak fishing which I am guessing will take me into spring next year.Great introduction to the Outback looking forward to the follow ups. Will be dropping into the South West Show at the weekend as part of my research. Keep in mind that your leg muscles are much stronger than your arms, allowing you to go further faster in a Hobie. I have an Outfitter (tandem) and have towed a small disabled boat 1/2 mile or so to shore against driving rain/tide/and wind. Granted, the tide flow in Florida is nowhere near what you experience in the UK, but try that in a paddle yak with calm weather. I've also struck Redfish with this kayak, the propulsion system is that quiet if you are careful. I'm glad you found your new love Rob, I've had mine for 5 years now and nothing compares! 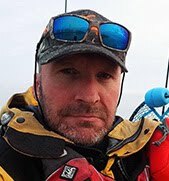 What advantages do you feel the outback has over the Big Game for the type of fishing you tend to do in the UK which appears to be bottom fishing with bait at anchor? I am predominately a UK lure fisherman fishing from a Prowler Big Game and there is no doubt that if I changed and could afford it I would go for a Hobie for the advantages of hands free trolling, being able to hold a position if castings lures towards the shore and possibly when drifting and not having to use a drift chute however, If I mainly fished bait at anchor I cannot see why the hobie would be any better than the Big Game apart from the peddling to the mark as opposed to paddling. To date, the majority of my fishing had predominantly been bait fishing at anchor. The Outback has greater stability which is beneficial when anchored, especially in a strong tide, at night or a combination of both! Despite the loss of the centre console area due to the fitment of the Mirage Drive, the layout of the Outback is more angler friendly which is clearly more beneficial whilst anchored up fishing. Yes it's faster than the Big Game, certainly with the ST Turbo fin upgrade installed. That'll be beneficial in reaching a mark faster, though more interestingly it'll enable me to consider marks further afield. The improved speed will also be beneficial should the weather deteriorate or I am forced to paddle against the tide or headwind, etc. That said, I'm looking to seriously re-invigorate my fishing over the next few months and rekindle my interest in lure fishing, perhaps even fly fishing. For that the Hobie will really come into its own. Awesome review. Let's be honest, Hobie really have changed the game when it comes to kayaks, just like they did to catamarans back in the day. I think it's safe to say that one of the mirage brotherhood will be my next kayak. Im not sure about the outback though for lighter paddlers as I dont think I'm heavy enough to really do well in the Outback, the revo seems to be be better suited to people with a bit less mass. Hey there Julian, thanks for your comment. I weigh in at 90kg (200lb), so I'm not exactly heavy. I know a few avid anglers a little lighter than myself that swear by the Outback. The Revo is also a cracking kayak, though it's far more tippy and less roomy. The Revo will however will be a tad quicker. I think that the biggest difference is width and weight which makes the Outback more difficult to man-handle. Great write up Rob and excellent information, cheers! I'm getting an Outback very soon and this article has really helped me. I'm looking forward to your next article on the Outback fins which is what drew me here. Great covar rob, fully looking for your next blog post. 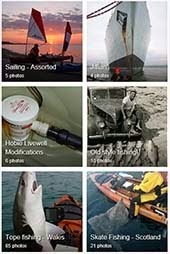 I myself is a kayaker, and following your blog for a long time.